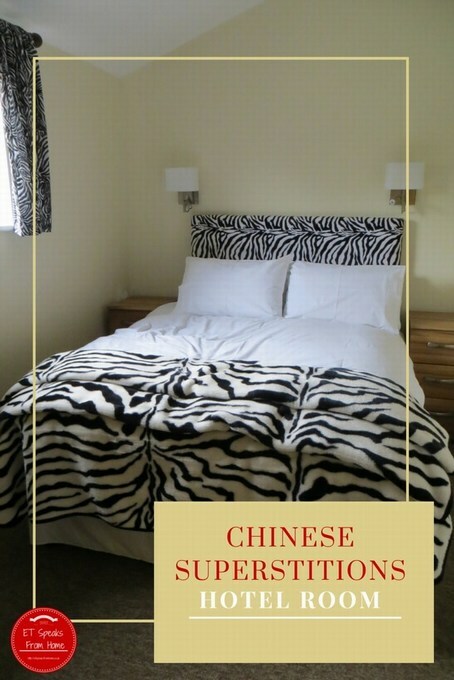 Chinese Superstitions to enter a Hotel Room! Last February, my mum and sister both flew to the UK to visit us. While they were here, we all went on a road trip to Scotland. You can read more about our Scotland trip with Barny here. This is to inform the ‘owner’ / spirit that you hope they respect your stay and we mean no harm. This is to fill the room with positive energy (yang). Hotels are classified as yin, so by getting the yang into the room will balance the yin and yang. To get rid of any negative energy in there. Chinese believe that toilets are negative places because chi (good energy) is similar to water and is escaping down the pipes and drains. This is to ensure the spirit will not wear it and track you down. Leaving shoes the wrong way round will confuse the spirit. This is a tip that I learnt from my friend J. Ng. She said the spirit will wear it and follow you home. I am a very neat person and I can’t stand any mess but for this, I always kick both shoes in a different direction. If my children put it neatly, I will ‘accidentally’ kick it apart to mess it. This is my number one hate in hotel! Why they always put a huge mirror opposite the bed! In feng shui, they mentioned that a mirror facing the bed directly depletes your personal energy when you need it the most. If you happen to see the book that the book is open, don’t close it. They are open for a good reason. I learnt this ‘tip’ from watching too many ghost horror movie. I remember watching one movie where the actor closed the book and it broke the spell which released the ghost! As mentioned earlier, a few years ago, I had trouble staying in a hotel in Japan with Mr C. So I opened two holy books that I could find in the room and placed them in each corner. Only since then did I have a good nights sleep. Chinese believe number four means death in Chinese. You might notice that some Asian hotels do not come with a level four or door number starting with four. In many cultures people like to avoid the number 13 because it’s associated with bad luck. It is the same kind of reasons. Whenever I had to travel alone, I would place all my belongings on the spare bed so that I am not inviting any ‘lost soul’ to be in the room with me. I will also sleep with light on and TV! Spirits dislike crowds as they will have lots of strong energy. I am trying to create an atmosphere to cheat my stay! Do you have any particular hotel routine? Do you have any experience or tip you would like to share with me?